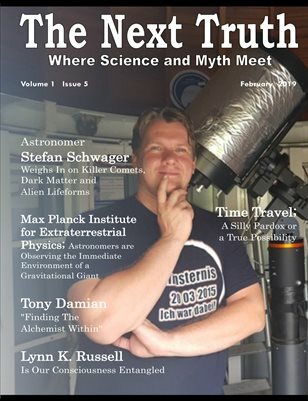 In the February issue of The Next Truth we fasten our seatbelts and travel with the Max Planck Institute for Extraterrestrial Physics to the edge of a galactic black hole, shine a bright light on a cosmic evolution with the director of Riesa's (Germany) observatory Stefan Schwager, and learn from the publisher of Paranormal Underground Magazine Chad Wilson how the universe provides us what we truly need. Also in this issue; a mind dazzling theory of how to time-travel with standing waves, chapter IV of the thrilling SF story of Warwick's physics professor Bill Murray “Death Finds a Way or Mud“, Shaman Tony Damian speaks about finding our true self in chapter IV from his book "Finding the Alchemist Within", Joseph B.H. McMillan is discussing the existence of God one more time, and author Lynn K. Russell explores our consciousness by leaping into Quantum physics.